Just wanna greet my mom a HAPPY 64th birthday today! 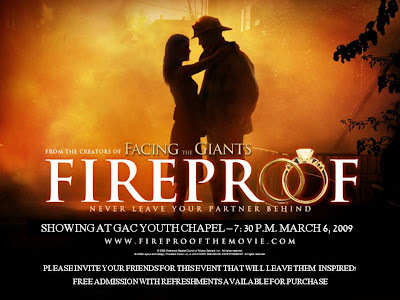 Fireproof: A love story made to inspire. I just want to share a beautiful movie. I have always wanted to share this to all of my friends here. I watched this together with the Symphony for Jesus Ministry during our fellowship night a couple of months ago and I just got reminded about this just recently. The film is about Love, Forgiveness, Change and Faith. While there's a whole lot of couples going through divorce, this movie surely will give you a better insight of how relationships should be handled. Alone we cannot run our lives or relationships, so we need an intervention that has been tested since the the earliest days of man. Divorce according to the bible is clearly stated, while for any reason a divorce becomes the only option, the couples separate but neither of them will marry or else they will commit adultery. Failed relationships almost always starts with miscommunication and a prideful and unforgiving spirit. This movie is a two thumbs-up for me, it really made see how love can open things up. Just remember Jesus wants us to love unexpectedly and unconditionally just like what He did to us and us Christians our goal in this earthly life is to practice our Christ-like character in preparation for the eternal citizenship that the Father will give us through His Son Jesus. RATED E! Exclusively Explosive Earvilicious Escapades! in the midst of the crowd..